Soon to turn nine, Eddie Pipper hopes to get a pet penguin for his birthday. The fact it’s an unrealistic aim in terms of species doesn’t matter. See, in the past, Eddie forgot to latch the mouse cage (they escaped) and to feed the goldfish (they died), so Mum said no more pets. Still, the penguin obsessed dreamer hopes that if he proves to Mum and Dad that he’s responsible he’ll get a penguin. At story opening, readers see Eddie’s creativity with his obsession. Not only is he making a penguin out of paper mache, he dressed up his little sister as one. Sadly, he forgot that he left her in the blow up pool with ice in the water. And he used paper from Dad’s study to paper mache with. Paper containing plans for an origami competition Dad was entering. Origami is Dad’s obsession. Like father, like son. But this helps Dad understand Eddie a little better. As a fan of Brian’s work I was pleased to see the writing bore her signature humour. I laughed out loud, not only in regard to Eddie’s action but also that of others. Like when Mum finds he placed his sister in a pool of ice and forgot her, she points out the evidence like so, ‘Fridge door. Open. You?’ Eddie nodded. Why did his mum talk like she was texting him? He was right in front of her. While it may at first seem that Eddie is simply forgetful, the story unfolds to show how his obsession overtakes and consumes his thoughts to the exclusion of practical things like remembering his school bus money or his swimmers and towel the day of the swim certificate test. Readers who have longed for something special not quite within reach will empathise and cheer dear Eddie on. When he arrives home late for his birthday party, Mum is pleased to learn it’s not because he forgot about it but because he stopped to help an abandoned dog. This results in Eddie winding up with a pet. Not the one he hoped for but one he’ll have much fun with. Colourful illustrations within each of the nine chapters break up the well-spaced text, making it most appealing to readers finding their feet in the world of chapter books. 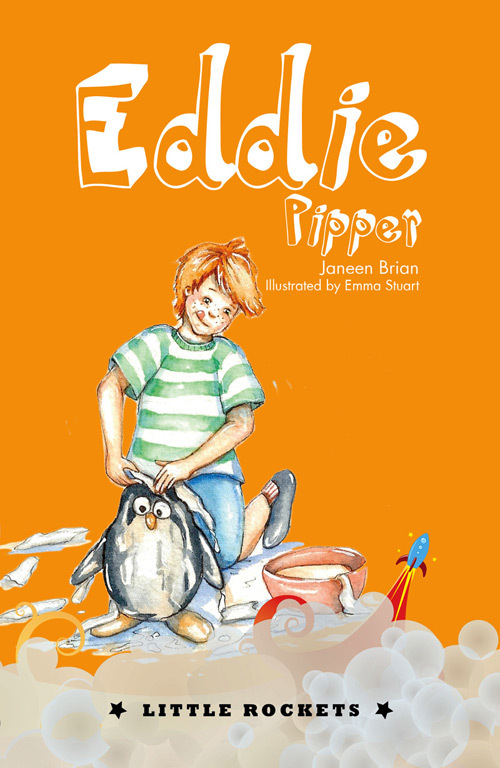 High quality paper used in production of this Little Rockets series, for readers aged 7+, will prove excellent for very likely repeated library borrowing.